By definition red cooked pork should be made using pork belly. This is the most tender cut of pork suitable for braising, which is what red cooking is about. The gelatin from the skin contributes to the final silky thick consistency of the sauce. Personally I would not replace it with other cuts of pork. “But it is so unhealthy!” That’s the refrain often repeated and, yes, I concur. However, there are ways to minimize the fat consumption. Many people are not aware that most of the fat renders during the long hours of braising and leaves mostly connective tissue and lean meat. I suggest you make this dish a day ahead. Separate the meat from the sauce and refrigerate them overnight in different containers. The next day the fat will have solidified on top of the sauce jelly and you can easily discard it before reheating. Admittedly it does not completely remove all the fat. Red cooked pork is still a dish one would consume in moderation. Eating the fat connective tissue is an acquired taste. I remember only a few years ago my non-Asian guests would balk at eating the fat of the red cooked pork at my dinner parties. Now everyone seeks out the tender marbleized pork belly when I serve this dish. In fact it is almost impossible to avoid pork belly on restaurant menus these days in New York and other cities. I believe the enjoyment of red cooked pork requires educating the palate and understanding the health issues. When I first started cooking Chinese food many years ago my Aunt Hong told me that it is important to always par-boil meat that is intended for braising or soup making. I used to think of this step as redundant and cumbersome. For years I made my red cooked pork by simply browning the meat in caramel then adding liquid to start braising. But then I realized the resulting sauce was almost always muddied with residue and looked rather unappetizing. I experimented with different variations of par-boiling and caramelizing. My conclusion is that the best result comes from the four-step technique of first par-boiling the original large slab of pork until cooked through, then cutting it up into pieces and caramelizing the meat in sugar, before braising in the aromatic ingredients. 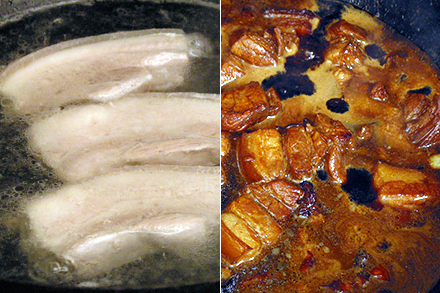 Par-boiling pork in plain water creates a thick film of congealed pork blood on the surface of the liquid that can be removed with a very fine mesh skimmer. Or you can simply discard the cooking liquid and retain the clean slab of pork belly to cut up for braising. Removing the scum at this stage makes it possible to produce a clean sauce at the end. These steps are described in more detail in my Red Cooked Pork Redux post. I recommend reading it and not skipping this step. Caramelizing is one of the most important steps in making red cooked pork. I suggest using granulated sugar in my recipe because it is readily available. The key is to prevent the sugar from getting burnt. To avoid burning make sure the heat is reduced to medium just as the sugar turns a yellowish color. Immediately add the pork pieces to the caramel. The moisture from the pork will in fact dissolve the sugar and evenly coat the meat. If you wait until the sugar has become too dark before adding the meat. The caramel will harden just as Sabino wrote in his comment. At this point keep the heat at medium and regularly toss and turn the meat so it browns gradually and evenly. Be aware that as the fat starts rendering it often splatters. You may want to use a splatter guard to reduce the chance of any accidental burning. Traditional Chinese recipes call for using rock sugar to caramelize. If you decide to use rock sugar, it should be heated and dissolved in about 1/4 cup of water. Let the syrup cook down until it begins to turn yellow. From here continue with adding the pork pieces and caramelizing over medium heat. If you are able to obtain it, I recommend using rock sugar because it will give the sauce a beautiful glistening quality. Different people reduce the sauce to varying degrees of thickness. There is no definite rule for reducing the sauce. For me I like the silky texture similar to a demi-glace in French cooking. The sauce should hold together in a thick layer when poured on a plate. If you’re serving the red cooked pork with rice I suggest a thinner sauce. Pouring this runnier sauce over rice makes a much more flavorful combination. It is advisable to remove the meat once it has cooked to the appropriate tenderness. That way you can reduce the sauce without over cooking the meat. 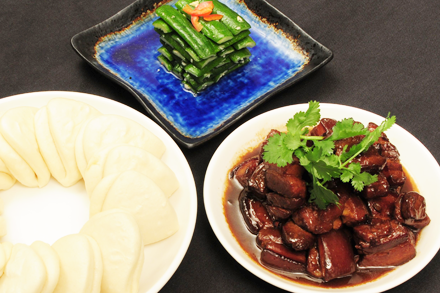 In a Chinese meal we always serve a combination of meat, vegetable and grain. A meal for four often includes one meat dish, one vegetable dish, one soup or cold dish, and a rice or noodle dish. The meal remains nutritionally balanced and excessive fat intake is limited. Therefore red cooked pork is rarely served on its own. When served as lunch over rice red cooked pork is almost always paired with stir-fried bok choy or another green vegetable. Cucumber salad or other refreshing pickles often accompany red cooked pork when served in a bun. I hope this post clarifies many of the issues arising from making red cooked pork. I want to thank Sabino for taking the time to write his comments. It is this community sharing spirit that makes Red Cook a success. And lets hear it for pork belly! Great tips. That’s how we do it back home. Particularly, I would like to echo your comments on health. Growing up in Shanghai, we rarely thought about fat content. Looking back, we really didn’t eat any less greasily than your standard American fare. Yet, fat was not an issue back then. Most people weren’t fat despite eating heartily. However, It is now becoming an issue in China as it has been in the States. So what changed? In my observations, 2 things. 1) Portion size, and 2) food combination. In China, eating a meal is literally called “eating rice.” The implied understanding is that the dishes you cook are all there to help you eat rice. Further, when we look at dishes served at any meal, it is absolutely essential you have vegetables. That means, while it is optional to have a meat dish or a soup dish, vegetable dishes are a constant staple on any dinner table. Red cooked pork is served once in a while, not every day. It can be eaten for many days on end, because let’s face it, how much red meat and sauce do you really need when you simply need to eat 2 bowls of rice. Not to mention the fact that the red cooked meat is competing for bowl space against veggies. Why weight is becoming more and more of a problem now in China is that the portion size has skyrocketed. And what was once a luxury – eating a meal without rice – is now becoming more and more of a trend. In fact, the last time I was in Boston, I went to the ever reliable Shanghai Gate for dinner (they have some really good food), the waitress was stunned when I asked for rice. She remarked how would I be able to finish the 5 dishes I had ordered. I naturally answered that I had no intention of finishing any of them, and that I fully intended to take most of the dishes home. A meal, to an old-school Chinese like me, just isn’t a meal, without grains and vegetable. So for all who worry about fat content in Chinese cooking, I would say moderate only your portion and your food combination. When it comes to authentic tasty Chinese food, one should not sacrifice taste over a little bit of fat. The last thing anyone wants to eat is something that doesn’t quite achieve the right umami. Xin, I am a great believer in consuming a balanced diet. Always include vegetables and grains in your meals and eat in moderation. That’s my motto! First of all – I love your blog and reading it for a while. Not so many blogs not only posting recipes, but also explaining everything so deeply. Thanks you for that. I’m an European living in China 5 years, recently relocated to Kunming, before spent 4 years in Xiamen. Chinese cuisine is one of my hottest affairs, next year I will be taking a course in Sichuan’s cooking institute. Does that mean that no oil is involved in caramelizing? Or I have to add the syrup to the oil and then caramelize meat in that mixture? Thank you for visiting Red Cook and for your kind words. You should use the oil regardless so as to make it easier when you add the meat to caramelize the sugar. Toss the meat around constantly until the sugar completely caramelize. Thanks for pointing out the error. I’ve updated the name properly. Sorry Sabino for the mistake. Thank you again. This recipe is definitely a keeper. Hi Alex, Thank you so much for your kind words. I am delighted that you are enjoying Red Cook as well as red cooked pork! It is always gratifying to know my readers are successfully cooking classic Chinese food. I am a latecomer to red cooked pork. 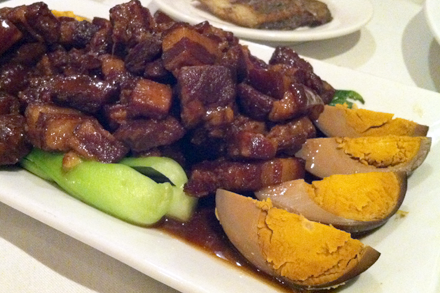 I had heard that this was Chairman Map’s favorite dish so when I go to a new restaurant I ask for Chairman Mao’s Pork. If they have it on the menu, it’s in the bag, plus it starts conversations. If it isn’t on the menu, it still starts conversations! Fantastic recipe with the tips for top notch preparation. 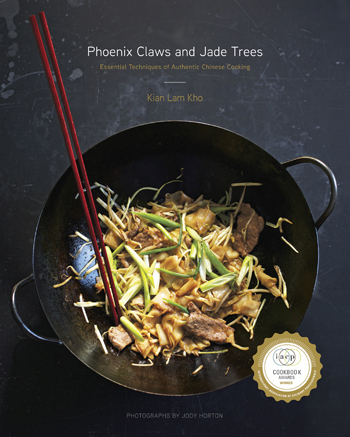 Thank you for penning a recipe which plays a central role in Chinese gastronomy. thank you for your useful tips and many authentic informations you are providing here, it helps me cook more authentic chinese dishes. Yesterday my mother visited me for dinner and I cooked red cooked pork for us, she liked this hearty dish. I served the meat and reduced sauce with fresh steamed rice, cooked egg, some sprinkled scallions and just a few cucumber slices. I am so glad you enjoyed the red cooked pork recipe. This recipe truly is very flexible and delicious. Serving the pork with congee sounds absolutely wonderful! Thanks for your suggestions and wonderful comments. Hi. Like to ask if really need caramelising step or a safer way to do it? I was burnt by the splattering melted sugar when added the meat + messy stove top. Meat also turned out slightly crusty rather than soft. You can make the red cooked pork without caramelizing the sugar. But there will not be the rich flavor with depth associated with the process. I suggest that you try reducing the heat when you’re caramelizing. The tough outer layer indicate that you have charred the meat too much. The meat should only be brown and charred black after the caramelizing process. As for the oil I suggest that you use a splatter guard or a wok cover to keep the oil from burning you. Uncover occasionally while caramelizing to turn the meat. Is this recipe the same as the the pork dish shown in Ang Lee’s film “Eat, Drink, Man, Woman”? In the film, the father deep fried the pork chunk after braising. He then put the pork in iced water, after which he sliced and arranged them in a bowl and put it on a bamboo steamer before serving. Could you please advise on why he deep fried and steamed the pork? This is not the same recipe as the one you described. This is a braised dish based on the “red cooking” technique. The recipe in the film is known as “kou rou” or “uncovered pork.” It is based on a technique that steam an arranged array of sliced pork belly with various spices. Once cooked the meat is “un-molded” onto a shallow bowl displaying the arrayed arrangement. 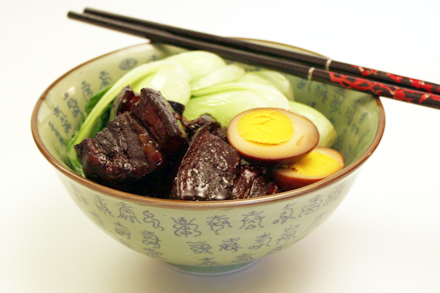 “Kou rou” often is accompanied with pickled or dried greens of various kinds. Unfortunately I do not have a recipe for this on the blog yet. But now that you’ve inquired I may just consider including a post on this pork dish. You can find Shaoxing wine in just about any Chinese grocery store. As a replacement I would suggest using dry sherry. As the author and everyone is a fan of red braised pork belly…I too have begun the process of mastering it. I learned a lot from reading this and just love everyone is so passionate and driving for authenticity. I have some pics of mine but dont know how to share with the blog??? Any advice. My comments are parboiling is critical! Browning with sugar very difficult in a wok…I use a small saute pan to control heat and not let sugar harden. I deglaze with Shaoxing Wine. Thanks again..this is the divine dish Mao loved for sure! I’ve been eating hong shao rou for years and never seemed to remember all the different ways my family friends have made it haha! As I just recently moved from USA to Singapore, my expat friends and I decided to throw a potluck this weekend when I suddenly thought about making this dish…which version to make? Do I use dark, light, or combination soy sauce? Do I caramelize or not? Should I serve a velvety or thin sauce? Should I add daikon/carrot/shitake or not? Sooo many questions have flooded my head that I’ve barely slept for 2 days and (even now) woke up at 3am and have been recipe hunting online for the past 3 hrs so I’m super thrilled I finally came upon your blog!! Really appreciate you writing so many entries about this dish as it is definitely one of my favorite staples and helps demystify some of the techniques. I can’t wait to try your recipe out this weekend!! I do not advocate the use of fa cai (髮菜) as it is a desert plant that is endangered. There is currently no effective farming technique for this plant. So I recommend that you do not use fa cai in your cooking. Thanks for the link to kao fu! Wow, I didn’t know that about fa cai…good warning!! Can’t wait to try this dish and look forward to the others when you get time to experiment. 1. Only put enough liquid to cover all the pork when braising. Cover the pot when braising so the flavor will be infused properly and it will also accelerate the cooking process. The level of simmering can be judged by observing small bubble continuously rising from the bottom of the pot. Any lower temperature will take much too long to cook. Do keep in mind that we all have our preference for the tenderness of the meat. If you enjoy the pork belly to completely fall apart then cook it longer. Otherwise adjust the cook time to the doneness of you choice. 2. When the pork pieces are cooked to your desired doneness, remove them from the pot and set aside. Then continue to reduce the braising liquid. The gelatin from the pork skin will thicken the sauce. Again the tichkness of the sauce can be reduced to your personal preference. I hope these tips will help you with your red cooked pork. Thank you so very much for posting this recipe. I had this at my Grandfather’s many times as a child. I bought a Pork Belly and will cook this tonight as part of my Lunar New Year’s dinner. My family immigrated to the US in 1875 to the Deep South so we were legally “Colored” and had limited economic opportunities. So (like in China) we ate meat sparingly and could only afford the cuts of meat not wanted by “Whites”. So each of us got only a very small portion of this dish. Of course if a person eats this dish like they would a steak or prime rib it would be unhealthful. If one eats it to flavor rice as it was designed to be eaten this dish would not be unhealthful. Food should be taken in context of the history and culture it was developed and not judged by modern American standards. There are thousands of other traditional Chinese dishes that have less saturated fat, perhaps those who do not like this recipe can cook one of those.